Showers this morning will give way to thunderstorms this afternoon. Severe weather is not a large concern today. Numerous showers this morning ahead of a warm front will give way to thunderstorms this afternoon. 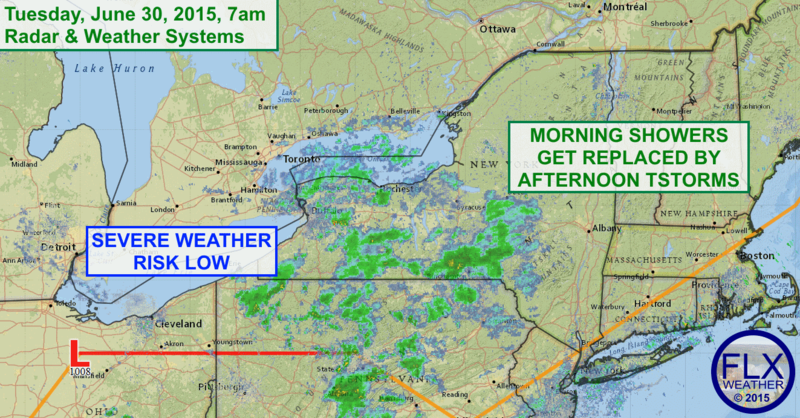 The showers in the area this morning should lift north throughout the morning and weaken. However, this will be a short term trend. Additional showers and thunderstorms are likely to develop over the Finger Lakes as soon as the early afternoon hours as a disturbance from the Ohio Valley rotates around the parent low, which will be moving into southern Ontario this afternoon. The atmosphere will not have much chance to destabilize between bouts of rain, so our severe threat should be quite limited today. A briefly stronger storm is still not our of the question, but for the most part, little to no severe weather is expected. There still could be some isolated flooding concerns for areas that see multiple heavier thunderstorms this afternoon. The magnitude of flooding should be fairly minor though, with some ponding of water in low lying and poor drainage areas. Thunderstorms will quickly dissipate as the sun sets tonight, with just a few scattered showers overnight. It now looks like we will do it all over again tomorrow, with more showers and thunderstorms. Our next dry day is Friday.